1Faculty of Life Sciences, Kyoto Sangyo University, Kamigamo Motoyama, Kyoto, Japan; 2National Institute for Basic Biology, Okazaki, Japan; 3School of Life Science, The Graduate University for Advanced Studies, Okazaki, Japan; 4Faculty of Agriculture, Kochi University, Nankoku, Japan; 5Faculty of Science, Yamagata University, Yamagata, Japan. Copyright © 2014 Hokuto Nakayama et al. This is an open access article distributed under the Creative Commons Attribution License, which permits unrestricted use, distribution, and reproduction in any medium, provided the original work is properly cited. In accordance of the Creative Commons Attribution License all Copyrights © 2014 are reserved for SCIRP and the owner of the intellectual property Hokuto Nakayama et al. All Copyright © 2014 are guarded by law and by SCIRP as a guardian. Figure 1. Gross morphology of Rorippa aquatica. (A) Flowers on inflorescence; (B) Regeneration of leaf fragments; (C) A regenerated plantlet; (D)–(G) Morphological variation in shoots and leaves. Shoots in terrestrial environments (D) and submerged aquatic environments (E). Leaves in terrestrial environments (F) and submerged aquatic environments (G). Bars = 1 cm. and become pinnately compound in submerged aquatic environments (Figures 1(d)-(g)) [7,8]. Although heterophylly is widely noted among diverse plant species from ferns to angiosperms [8-10], little is known about the mechanism that regulates this phenomenon, because of the lack of an adequate model species. A previous study indicated that lake cress has some advantages as a model for studying heterophylly, such as plant size, easy maintenance, and systematic positioning (closely related to Arabidopsis) . Hence, lake cress has received considerable attention from ecological, developmental, and physiological perspectives. Although lake cress has such interesting characteristics, its phylogenetic position and taxonomic status are not yet known due to the considerable overlap of morphological characteristics of related genera . Therefore, the nomenclature of lake cress has remained ambiguous thus far. Lake cress was originally described as a variety of horseradish (Cochlearia armoracia var. aquatica Eaton) . However, later, Eaton  recognized it as a distinct species of Cochlearia. Subsequently, lake cress was treated as a species of Nasturtium, Rorippa, or Armoracia [14,15]. It was once also described as a monotypic taxon in the early history of its nomenclatural changes: Neobeckia aquatica . Greene indicated many morphological and ecological differences and suggested that lake cress was sufficiently distinct to be recognized as a monotypic genus . The systematic position of a species can be confirmed using molecular phylogenetic analyses. The only phylogenetic analysis reported in lake cress thus far was performed using the plastid gene rbcL . The study suggested that lake cress is clearly distinct from Armoracia and could be treated as a monotypic sister genus to Rorippa . However, the author sampled only 2 species of Rorippa, which comprise approximately 75 species . Therefore, the number of operational taxonomic units (OTUs) was not sufficient to confirm the exact phylogenetic relationship. Additionally, the previous analysis was performed using rbcL, and hence, the author detected little variation in the region among species . Hence, the phylogenetic relationship between lake cress and species belonging to the genus Rorippa and whether lake cress should be treated as a monotypic genus remain unclear. Indeed, the worldwide monograph of Brassicaceae presented by Appel and Al-Shehbaz  reduced Neobeckia to a synonym of Rorippa, and lake cress was treated as a species belonging to the genus Rorippa (R. aquatica) in the Flora of North America . Thus, reconstructing the phylogenetic position of lake cress is an interesting aspect for clearly understanding its taxonomic status. Additionally, this analysis might be useful for understanding the processes for acquisition of heterophylly from the evolutionary perspective. In this study, we reconstructed a relationship between lake cress and species belonging to the genus Rorippa to clarify their phylogenetic position by analyzing multiple regions of cpDNA. Moreover, we analyzed the chromosome number of lake cress to elucidate the evolutionary origin of the species. Our results indicated that lake cress is a member of Rorippa and confirmed that the species should be treated as Rorippa aquatica (Eaton) EJ Palmer & Steyermark, as indicated by previous taxonomic studies [17,18]. Seventeen samples were investigated in this study (Table 1). R. aquatica were grown at the Kyoto Sangyo University, Japan, and planted in soil in growth chambers. Plants were grown at 20˚C with continuous light. 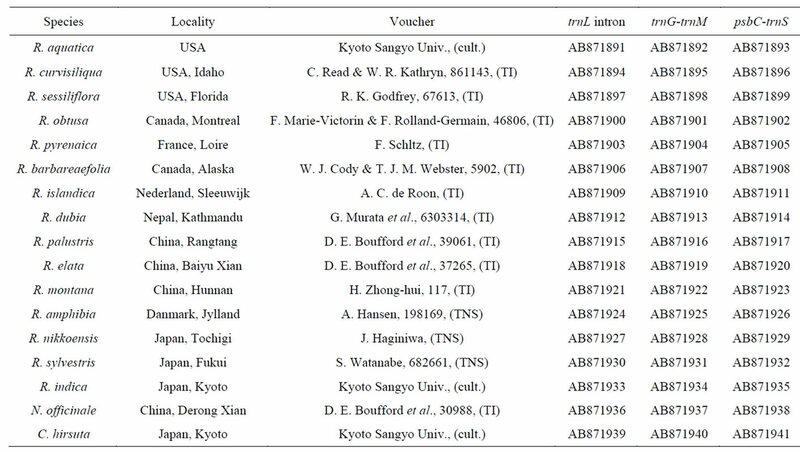 Voucher specimens for all newly sequenced taxa were deposited in the following herbaria: Herbarium of the University of Tokyo (TI), Japan, and Herbarium of the National Museum of Nature and Science (TNS), Japan. Nasturtium officinale and Cardamine hirsuta were selected as outgroup according to the taxonomic classification of Les . Table 1. List of species, voucher numbers, and accession numbers of plant materials. Herbarium acronyms follow Index Herbariorum Part I .
until use. For phylogenetic analysis, trnL intron, trnG (GCC)-trnM (CAU), and psbC-trnS (UGA) were amplified using specific primers (5’-CGAAATCGGTAGACGCTACG-3’: forward; 5’-GGGGATAGAGGGACTTGAAC-3’: reverse)(5’-TCTCTTTGCCAAGGAGAAGA-3’: forward; 5’-ATAACCTTGAGGTCACGGGT-3’: reverse), and (5’-TGAACCTGTTCTTTCCATGA-3’: forward; 5’-GAACTATCGAGGGTTCGAAT-3’: reverse), respectively. These primers were designed on the basis of sequences published in previous studies [19,20]. Targeted DNA fragments were amplified using an AB 2720 thermal cycler (Applied Biosystems). The polymerase chain reaction (PCR) cycle conditions were incubation at 95˚C for 1 min, followed by 40 cycles of incubation at 95˚C for 30 s, 55˚C for 30 s, and 72˚C for 40 s, with a final extension at 72˚C for 7 min. After the amplification, reaction mixtures were subjected to electrophoresis on 0.8% agarose gels to purify the amplified products by using QIAquick Gel Extraction Kit (QIAGEN). Cycle sequencing reactions were performed by using the purified PCR products, BigDye Terminator Cycle Sequencing Kit v 3.1 (Applied Biosystems), and the same primers used for the reactions. The products were resolved by capillary electrophoresis by using an ABI PRISM 3130 automated DNA sequencer (Applied Biosystems). All procedures were performed according to the manufacturers’ instructions. Sequences of trnL intron, trnG-trnM, and psbC-trnS were aligned using the CLUSTAL W program  and adjusted manually as necessary. All positions containing gaps and missing data were excluded from the analysis. Phylogenetic trees constructed using neighbor-joining (NJ)  and maximum-likelihood (ML) methods  were obtained using MEGA5 program . The bootstrap analyses  with 1000 replicates were performed using the same program for both the analyses. For the NJ analysis, nucleotide substitutions were used; the evolutionary distances were computed using the maximum composite likelihood (MCL) method , and the units were the number of base substitutions per site. Codon positions included were first + second + third + noncoding. For the ML analysis, nucleotide substitutions were used, and the evolutionary history was inferred using the ML method based on the Jukes-Cantor model , because the number of nucleotide substitutions per site was low (approximately 0.05 or less). The initial tree(s) for heuristic search were obtained automatically by applying NJ and BioNJ algorithms to a matrix of pairwise distances estimated using the MCL approach, and then selecting the topology with superior log likelihood value. Codon positions included were first + second + third + noncoding as were in the NJ analysis. Fresh root tips were pretreated with 0.05% colchicine for 3.5 h at 18˚C and fixed with 80% ethanol for 30 min. After repeated washing with distilled water, root tissues were macerated in an enzymatic mixture containing 4% cellulase (Onozuka R-10) and 2% pectolyase Y-23 for 60 min at 37˚C. After washing, root tips were placed on a glass slide and spread using 20 µl ethanol-acetic acid (3:1) solution. 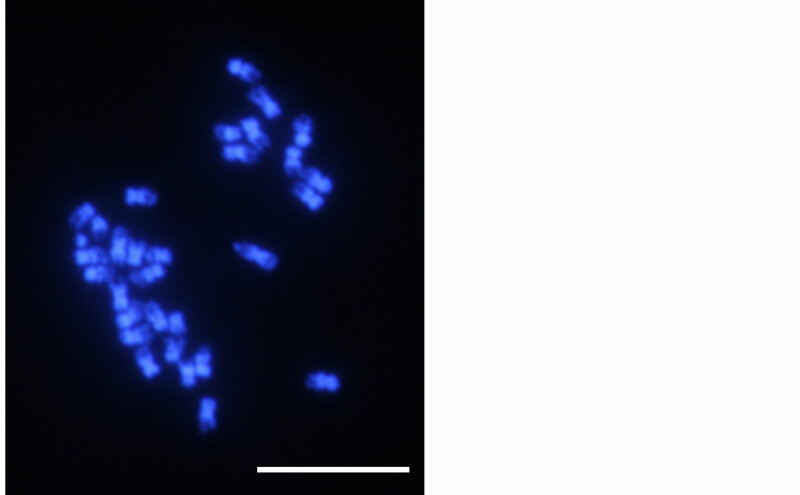 After overnight air drying, the chromosome preparations were stained with 1 µg/mL 4’,6-diamidino-2-phenylindole (DAPI) and observed under a microscope (Olympus BX51). The sequences of trnL intron, trnG (GCC)-trnM (CAU), and psbC-trnS (UGA) from 15 samples of Rorippa species and 2 samples from the outgroup species N. offici nale and C. hirsuta were determined. All nucleotide sequence data obtained for the 3 noncoding regions in this study were deposited at DDBJ (Table 1). The nucleotide lengths of these regions were 517 - 527 bp for trnL intron, 224 - 228 bp for trnG-trnM, and 205 - 222 bp for psbCtrnS. The phylogenetic analyses involved 17 nucleotide sequences. There were a total of 922 positions in the final dataset. The relationship between the clades and localities of individuals is indicated in Table 1. The optimal NJ tree with the sum of branch length = 0.09856586 is shown in Figure 2(a). The numbers of percentage of replicate trees in which the associated taxa clustered together in the bootstrap test (1000 replicates) are shown next to the branches. The tree is drawn to scale, with branch lengths in the same units as those of evolutionary distances used to infer the phylogenetic tree. The ML tree with the highest log likelihood (−1911.9178) is shown in Figure 2(b). The percentage of statistical support of trees in which the associated taxa clustered together is shown next to the branches. In our phylogenetic tree generated using cpDNA region, all Rorippa samples (including R. aquatica) formed a monophyletic group. Two major clades were recognized in Rorippa (Figures 2(a) and (b)). One clade included many Rorippa species used in this study and a highly supported group (93% and 88% for NJ and ML analyses, respectively) with 10 closely related species. This group was divided into 2 subclades (Figures 2(a) and (b)). The other clade involved 5 species, and R. aquatica belonged to this clade. Chromosomal analysis revealed 2n = 30 in the roots of R. aquatica (Figure 3). This result is different from that reported previously . Phylogenetic position and taxonomic status of lake cress have not yet been fully defined . At present, lake cress is recognized as R. aquatica according to contemporary treatment in the Flora of North America . However, molecular phylogenetic analyses of Rorippa species, including lake cress, are insufficient. Our molecular phylogenetic analysis confirmed that lake cress is a species belonging to the genus Rorippa, as indicated in the taxonomic studies by Palmer & Steyermark , and supported the treatment in the Flora of North America . Moreover, the phylogeny of cpDNA suggested that R. aquatica is relatively close to Rorippa sessiliflora and Rorippa pyrenaica. R. sessiliflora is known to be distributed from eastern to central regions of the United States  and shows partial overlap of distribution with that of R. aquatica . Therefore, speciation between these species might occur in the distribution range of these 2 species in the North American continent. Although these species might be closely related, various differences have been reported between the 2 species (e.g., annuals or perennials, presence of petals, and length of filaments). Hence, the relationship among R. aquatica, R. sessiliflora, and R. pyrenaica is still not clear. Revealing the detailed evolutionary processes of speciation among relatives of R. aquatica necessitates the analysis of more samples and molecular data. Our phylogenetic study showed the evolutionary path of acquisition of heterophylly in this genus. According to previous studies, the leaves of Rorippa amphibia showed heterophyllic changes . 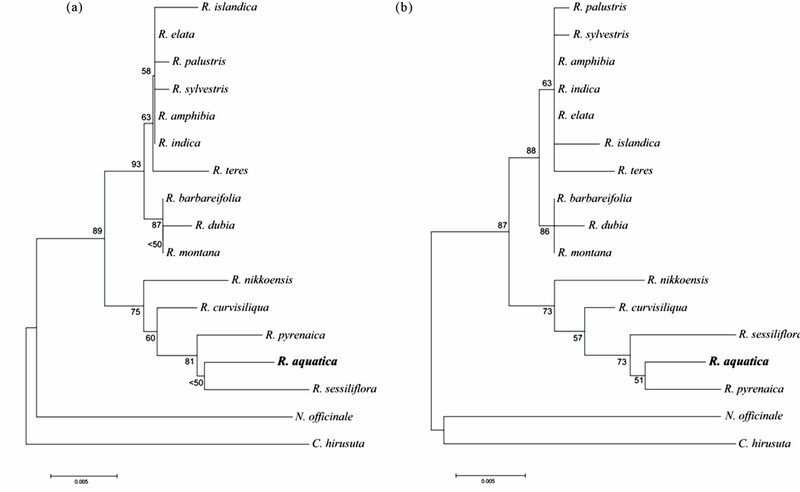 R. amphibia and R. aquatica did not form a monophyletic group in our cpDNA phylogeny. Hence, the result indicated that the acquisition of noticeable heterophylly occurred independently at least twice in the genus Rorippa. Thus, revealing and comparing the mechanisms of heterophylly in R. amphibia and R. aquatica would help determine whether the acquisition of heterophylly is a result of parallel evolution in the genus. Figure 2. Phylogenetic trees constructed using cpDNA sequences. The evolutionary history was inferred using the neighbor-joining method (A) and maximum-likelihood method (B). Evolutionary analyses were conducted using MEGA5 . The bootstrap values are indicated on branches (only those more than 50% are indicated on the tree). Figure 3. A photomicrograph showing chromosomes of Rorippa aquatica. R. aquatica (2n = 30). Bar = 10 µm. number of chromosomes in Rorippa (x = 8), it might be attributed to aneuploidy of triploid or tetraploid species. This irregular chromosome number might also have occurred due to intergeneric crossing, although the parental group was unknown. Chromosome variations such as polyploidy or aneuploidy are known to play an important role in plant speciation . In R. aquatica, some phenotypes have been reported to differ depending on the populations [2,6]; thus, some such differences might have occurred due to the differences in chromosome number. In this study, we analyzed the phylogenetic relationship of the genus Rorippa while focusing on the systematic position of R. aquatica. However, we sampled only 15 species of Rorippa, and hence, many issues remained unresolved. To address these issues, phylogenetic analyses performed using a wider range of species and regions showing high variation, such as nuclear DNA sequences, might be effective. Such further analysis might allow better understanding of the phylogeny and evolutionary processes of the acquisition of heterophylly in the genus Rorippa. We thank Drs. N. R. Sinha, H. Ikeda, O. Yano, A. Ebihara, and A. Kawabe for providing plant materials. This work was partially supported by the following sources —JSPS KAKENHI Grant Numbers 22870031 and 24770047 and The Science Research Promotion Fund from the Promotion and Mutual Aid Corporation for Private Schools of Japan—to Seisuke Kimura and a Research Fellowship from the Japan Society for the Promotion of Science to Hokuto Nakayama. C. D. Larue, “Regeneration in Radicula aquatica,” Michigan Academician, Vol. 28, 1943, pp. 51-61. J. D. Gabel and D. H. Les, “Neobeckia aquatica Eaton (Greene) North American Lake Cress,” New England Plant Conservation Program, Conservation and Research Plan, 2000, pp. 1-31. The Nature Conservancy, “Element Stewardship Abstract for Armoracia lacustris,” Arlington, Virginia, 1995, pp. 1-14. R. L. Stuckey, “Armoracia aquatica Disappeared from Central Portion of Its Range,” In: R. L. Stuckey, Ed., Aquatic Plants Reference Manual, Complied Publication Series, Columbus, 1987, p. 231. D. H. Les, G. J. Anderson and M. A. Cleland, “Sterility in North American Lake Cress, Neobeckia aquatica (Brassicaceae): Inferences from Chromosome Number,” Rhodora, Vol. 97, 1995, pp. 185-200. USDA Forest Service, “Rorippa aquatica (Eaton) E. J. Palmer & Steyermark (Lake Cress),” 2005, pp. 1-32. N. C. Fassett, “A manual of Aquatic Plants,” The University of Wisconsin Press, Madison, 1930, p. 235. A. Arber, “Water Plants: A Study of Aquatic Angiosperms,” Cambridge University Press, London, 1920. A. Eaton, “Manual of Botany for North America,” 3rd Edition, Oliver Steele, New York, 1822. A. Eaton, “Manual of Botany for North America,” 3rd Edition, Oliver Steele, New York, 1829. I. A. Al-Shehbaz and V. Bates, “Armoracia lacustris (Brassicaseae), the Correct Name for the North American Lake Cress,” Journal of the Arnold Arboretum, Vol. 68, 1987, pp. 357-359. E. L. Greene, “Neobeckia aquatica,” Pittonia, Vol. 3, 1896, p. 95. O. Appel and A. Al-Shehbaz, “Cruciferae,” In: K. Kubitzki, Ed., The Families and Genera of Vascular Plants, Springer Verlag, Berlin, 2003, pp. 75-174. Flora of North America Editorial Committee, “Flora of North America, North of Mexico,” Magnoliophyta: Salicaceae to Brassicaseae, Oxford University Press, New York, 2010, p. 797. T. Nishizawa and Y. Watano, “Primer Pairs Suitable for PCR-SSCP Analysis of Chloroplast DNA in Angiosperms,” Journal of Phytogeography and Taxonomy, Vol. 48, 2000, pp. 63-66. N. Saitou and M. Nei, “The Neighbor-Joining Method: A New Method for Reconstructing Phylogenetic Trees,” Molecular Biology and Evolution, Vol. 4, 1987, pp. 406- 425. K. Tamura and M. Nei, “Estimation of the Number of Nucleotide Substitutions in the Control Region of Mitochondrial DNA in Humans and Chimpanzees,” Molecular Biology and Evolution, Vol. 10, 1993, pp. 512-526. Flora of North America Editorial Committee, “Flora of North America, North of Mexico,” Magnoliophyta: Salicaceae to Brassicaseae, Oxford University Press, New York, 2010, p. 503. Flora of North America Editorial Committee, “Flora of North America, North of Mexico,” Magnoliophyta: Salicaceae to Brassicaseae, Oxford University Press, New York, 2010, p. 497. R. C. Rollins, “Chromosome Numbers of Cruciferae,” Contributions from the Gray Herbarium of Harvard University, Vol. 197, 1966, pp. 43-65. V. E. Grant, “Plant Speciation,” 2nd Edition, Columbia University Press, New York, 1981. P. K. Holmgren, N. H. Holmgren and L. C. Barnett, “Index Herbarium,” Part I: The Herbaria of the World,” 8th Edition, International Association for Plant Taxonomy, New York Botanical Garden, New York, 1990.